ACI first trained in the Kisii region of Kenya in June 2009 at the request of another organization established in the area (SCOPE). The most common water sources in the area are springs (both protected and unprotected), shallow wells, rivers and some rain water harvesting mainly at schools. Water tests on a sample of these sources have shown high levels of contamination. The area is fairly densely populated with most people living on small plots. Boiling was the main water treatment method for those who treated their drinking water, but as firewood and charcoal are scarce, this was an expensive option. This information was gathered through ACI household surveys, focus groups and interviews. ACI conducted a number of training sessions at schools in the area and trained parent/teacher water teams in the construction, use, maintenance and promotion of the ACI water filter. ACI facilitated the order of the filter materials that were available for purchase by the groups that were interested in continuing to produce the filters. Following these trainings, over 550 ACI water filters were constructed and sold (a small profit accrued to the constructing group) to the surrounding communities. Currently there are 16 ACI water filter producing groups or social businesses in this region. ACI has also trained 10 Community Health Workers whose job it is to train the new and existing filter users in associated hygiene, safe water storage and good health practices. The Community Health Workers also carry out periodic household surveys and assist with water tests. The demand and interest has remained high and there have been many requests for training by other surrounding communities. It is ACI's goal to empower local experts to answer this demand while maintaining high standards of training and keeping transport costs low. ACI and the local communities also recognize the need for additional WASH training and applicable technology to further improve peoples' health and general well-being. Household surveys and focus groups have identified specific needs e.g. improved sanitation facilities and rainwater harvesting capability. Part of answering this demand is to have a centralized training center - what ACI is calling a 'Hope Center' - to be a demonstration site, training facility and also provide office space for local oversight staff. The proposed training center is situated in the heart of the community and was donated by community members and the local administration demonstrating both local need and local support for the project. Having a purpose specific training center will transform ACI's work in this area as we will have a location for continual training, oversight and testing facilities. This number is based on 10 filter producing groups each building a minimum of 50 filters for an average family of 5 people. This number will certainly grow as the social businesses operate on a rolling loan basis whereby sale of the filters provides capital sufficient for the next order of materials. Each filter producing social business will be located at a school to serve the surrounding community. The school provides secure storage for the construction materials and part of their reward is that for every 40 filters sold to their community, the school will get one free filter from ACI. This number is calculated on an estimated class size of 30 students. The initial unit will be demonstrated at the newly launched training center and it is expected that around 20 people per week will use the latrine. Employment will continue for the ACI local regional coordinator (part-time) in the area and we plan to hire one additional full time employee to help fully coordinate continual training, monitoring and testing. Each filter constructer runs their own social business, so with the 10 additional people trained, this will bring the number to 26. Related health and hygiene training is offered to all existing and new filter users (2,500+) by the 10 ACI Community Health Workers. Renovation of the building donated by the community to ACI for the training center will also provide temporary employment for around 20 local people including electricians, and general building personnel. ACI's main experience in the WASH sector lies in training local people in the construction, use, maintenance and promotion of the ACI bio-sand water filter. The ACI approach is that the program should be as locally managed as possible and driven by local demand. All of the materials for the filters are sourced locally and the suppliers are identified by ACI to help maintain quality control while keeping costs low. There is no ongoing cost to ACI beyond the initial training and supply of materials. The sale of the filters enables total cost recovery and generates the capital for the next order. As word has spread about the ACI program in the Kisii region, demand for filters has grown reflecting the applicability of the technology. One of the most significant reported benefits of using the ACI water filter has been the money and time saved from buying firewood for boiling. Surveys have shown that filter users like the taste and clarity of the filtered water. People have also reported that they have experienced a reduction in water borne illness in their households. It is well known that the simple bio-sand filter maintenance procedure can be one of the barriers to long term use. Part of the purchase agreement for the bio-sand filter is that the end user is trained to identify when the maintenance is required. The filter constructer is then obliged to return to carry out the first maintenance cycle and also train the end user on how to do it themselves in the future. ACI's approach is based upon leaving local experts who will also remain available to do any simple repairs if necessary. These local people would attend regular training sessions at the proposed Hope Center. One of the benefits of the ACI model is that there are many small decentralized social businesses producing filters vs one centralized manufacturing site. This really increases ownership and accountability of the program within the communities while keeping the cost of the filters down. However, this also brings challenges in terms of oversight and quality control. ACI periodically carries out household surveys and water tests on a random sample of households that have purchased filters. Part of the accountability is that if problems are identified, there is follow up and filters have been re-constructed and repaired in the past. ACI proposes to further increase its tracking and monitoring procedures through the purchase of an additional mobile testing lab. ACI recognizes that in order to optimize the effectiveness of our water program, we need to add other WASH related training and technology. ACI will always strive to do this within the parameters of our current approach, namely: locally trained experts, locally sourced materials and the creation of sustainable social businesses. It is planned that ACI will partner with Prof. Ted Loudon of Michigan State University in October 2010 to pilot a sanitation project which will focus on a urine diversion composting pit latrine. The Hope Center will also be a demonstration site for roof top rain water catchment systems; drip irrigation systems and various other beneficial technology. All of these projects will be carried out in partnership with other experienced implementers and all with the goal of empowering the local communities with the skills and materials to improve their health and well being. With full funding, the project would take place in 3 phases. Phase 1: Renovation of the Hope Center. Phase 2: Train & launch 10 new filter businesses. Phase 3: Oversight and testing. The community and schools in the surrounding areas are very supportive of ACI. The majority of the people who have purchased filters have never met the American ACI staff and the program is very locally driven. Each filter producer is a local person who essentially runs their own small social enterprise in their community. They use their own networks to promote the sale of filters and have a strong ownership of their business as their profit depends on them doing a good and professional job. The local community leaders and farmers co-op leased the training center building and grounds to ACI free for 10 years showing a strong level of support for the project. The ACI program in this area is also closely connected to schools through its partnership with SCOPE (School Communities Offering Projects that Empower). Up until the acquisition of the Hope Center, schools have hosted ACI training sessions and have been instrumental in disseminating information about the program to their communities. The government through the local administration in the area have granted the lease of the training facility to ACI for 10 years free of charge. ACI has had strong support from local chiefs, town councilors and village elders. The Minister for Education has also highly commended the program. The local water and sanitation board is undertaking a number of projects in the area such as constructing public latrines and supplying rain water storage tanks to schools. ACI has also provided a loan to a local youth group who have constructed a large greenhouse near the Hope Center. The greenhouse will serve as a demonstration site for drip irrigation and uses Kick Start’s ‘Money Maker’ pump. ACI also actively promotes high yield gardening practices and will have a demonstration high yield garden at the Hope Center. ACI believes that these activities strengthen the capacity of the community. ACI intentionally works with and listens to the women in the communities in which we work as they bear the main burden of caring for the household water needs. Women are quite often the filter constructers and it is wonderful to see them embrace their new role in empowering other women. Women also immediately see the benefits in terms of time and money saved by using the ACI water filter and are generally the most committed to the success of the program. The filters once properly installed, used and maintained have a life span of up to 10 years with no recurring costs. The ACI program is intentionally designed to be sustainable, replicable and scalable. There is no ongoing cost to ACI beyond oversight and testing. These costs are most intense during the scaling of the program in a region, after which time local filter constructers and users have garnered sufficient experience to carry the program forward independently. ACI has a dedicated funder that will match donations from foundations and corporations. These funds will more than cover the costs of ACI staff time on the ground in Kenya. Community members pay the full material cost of the water filters as well as a small installation fee to the filter producer (for 500 filters, this works out at $8,461). The community have also contributed the land and future Hope Center free of charge (approx. value $20,000). ACI has had a number of Kenyan interns from various universities who assist in water testing and oversight ($600 approx.). There is also significant volunteer time that is contributed part time staff and families who are purchasing the filter. ($1,200 approx.). We work with the BSF as well and am glad to hear that you have are approaching the implementation of the filters using a social entrepreneurial approach. Can you tell me a little more about the WASH Education and outreach strategy? If yes, can you tell me a little more about how you do it and what your mechanism for outreach looks like? Also, how much time and how intensive do you get when you are helping them build a micro-business? do you supply start up costs? If yes, how much? Do you offer micro-business development training? Do you find that the groups you work with have those skills? How many of your programs are income-generating? If it is a micro-business, where does the profit go? Is the filter affordable? do you have a program for those who can't afford it? Lastly, I think it's great that you have a training center. How do the people you train start their microbusinesses? Do you supply all the start-up costs? How do you vet those groups to whom you invest? Sorry, I had one last question. Can I learn more about the implementers? What is ACIs role? Are you a trainer, funder, and or implementer? Thanks for your questions and comments Gemma. ACI is an implementer that focuses on training local people in the communities in which we work. Our WASH education and outreach strategy is and will continue to be run by our local oversight staff and Community Health Workers (CHW). The CHWs currently meet with all existing and new filter users on a monthly basis, providing further training on filter maintenance, filter use, safe water storage and related hygiene. The CHWs also oversee 4 school communities and attend events, barassas (Chief's meetings) etc to raise awareness about the ACI program in their area. We hope that this outreach can be further developed with the addition of the WASH training center which we are calling our H2Ope center. Launching a new filter producing social business can be fairly time intensive as there is a lot of material to cover. Besides the filter construction training itself, there is also significant training on tracking and reporting etc. The skill levels of the people we work with vary quite considerably, but we have endeavored to make the training accessible and often work alongside a translator. ACI provides the initial supply of raw materials for the first 50 filters, the income from which provides the money to purchase the materials for the next 50 and so on. The selling price for the filters is set at 1,070 Kenyan Shillings (currently $13) which includes 250 Kenyan shillings (~$3) as the installation and maintenance fee for the filter constructing business. The remaining 820 Kenyan Shillings are paid back to ACI to purchase the next order of raw materials. We have found this rolling loan system to be very effective. All of our projects in the Kisii region are income generating. ACI have conducted household surveys and focus groups in the area and the feedback has indicated that the filter is affordable. The majority of the filter purchasers are around the $2/day or slightly below income level. Firewood and charcoal are both scarce and expensive in this area and people have reported substantial cost savings since using the ACI filter. With regards to vetting the groups that we work with, we have a number of procedures. When ACI expands the program into a new community, the local chiefs, leaders and community nominate a community member to be their designated filter producer. ACI then holds a meeting with the nominated filter producer and a representative from the local school where ACI's expectations are clearly defined. It is then optional for the nominated filter constructer to sign an MOU with ACI. The filter constructing businesses are based out of schools as this provides secure storage for the raw materials. The school representatives provide some oversight of the filter constructer and also report to the ACI regional coordinator on a monthly basis. Hiring one additional full time employee. In your proposal you have explained that you will hire one additional full time employee to help fully coordinate continual training, will he/she be paid salary? Which source of the salary comes from? How are you going to maintain his /her salary? Is the part time also paid allowance or not? Thank you for your questions. As detailed in our budget, the full time employee and the part-time employee will be paid salary for a 12 month period. Their main roles will be scaling up the program, coordinating the training and providing oversight. We have core funding to support the part time employee after the initial 12 month period. We need the full time employee during the initial scaling phase as this will require significant time to put training procedures, oversight mechanisms etc in place as well awareness raising. - more budget details (equipment v facility v operating headcount)? - What is the operating plan: how and how frequently with samples be taken? Would a filter plan such as in A Single Drop 's Uganda application be an acceptable alternative? The lab that we will use is the Oxfam DelAgua Portable Testing Kit. This is a mobile water testing lab that will be used primarily for ACI's work in the Rigoma Market/Keroka area, but will also be used for monitoring some of our nearby projects. The testing kit is appropriate for the type of project that we are running as it does not require electricity and is specifically designed for field use. The kit will be set up in one of the rooms in the Hope Center which is secure and centrally located. The tests will be run by one of our Kenyan staff or a Kenyan graduate student. As you will see from the proposal and budget, ACI will also use a portable Hach turbidometer. ACI follows CAWST's biosand filter testing guidelines and assesses the biosand filters according to the 8 normal operating conditions. Turbidity is one of these key indicators. This is a cost effective way of testing the biosand filters that also provides meaningful results. According to the CAWST guidelines for a large biosand project (greater than 100 filters), it is appropriate to test 5-10% of the filters using a random sampling procedure - ACI will follow this recommendation. Revisiting every filter such as the approach taken by A Single Drop would be very costly for a program such as ours which will have significantly more filters. Our approach is to use an effective monitoring and sampling procedure that will give us a good overall picture of how well the filters are being constructed, used and maintained and then to adjust and improve the program according to the results. The sample size will grow as the program expands. At present we are on our way to exceed 1,000 filters in the Kisii region by the end of the year. ACI's approach in this project will be to conduct household surveys, focus groups and water testing on a tri-annual basis. ACI will continue to use the LQAS random sampling procedure. The surveys will be conducted by the ACI Community Health Workers who will also collect the water tests. Turbidity tests (input and output samples) will be carried out on all filters surveyed. Full bacteriological tests (input, output and stored water) will be carried out on a smaller subset of the sample. In keeping with the recommendation of testing 5-10% of the filters, this will work out to 50-100 tests per monitoring round depending on the number of filters at that given time. This will also include a double and a blank test to ensure quality control on each testing day. I tend to be more conservative on the impact numbers. Maybe only 7-8 of your 10 potential business with take off. And then they may take time to get the market penetration you seek. Hope you achieve your numbers! Great question. We know from experience that not all of the businesses that we launch take off and a lot of the success depends on the motivation of the filter constructor and the demand from the local community. If after 4-6 months a business is not showing signs of growth, ACI moves the tools and materials for filter construction to a nearby filter producing group that is growing at a faster pace. ACI intentionally trains around 10 filter producing groups at a time to enable this movement of materials, while also ensuring that ACI staff time is best used and not dependent on the success of one individual group. So even if only 7-8 of the filter producing groups take off, we still believe that we will achieve our numbers using this approach. I would like to respond to a comment that was posted on the 'Ratings and Comments' section of this proposal. Unfortunately, the reviewer did not ask the question on this section as we would have been able to answer it in advance of the review. The comment stated that we did not have enough market research to ensure that the filters would be bought. This proposal is based on an expansion of our program in the Kisii area. 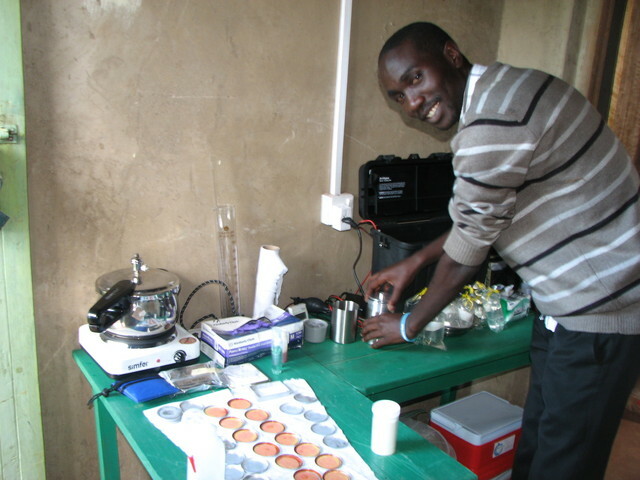 ACI provided the first 22 filters during our training sessions in June 2009. Since then, over 550 filters have been sold for a profit without a subsidy in the area and there are orders for many more. This is sound evidence that there is a demand for the filters and that people are prepared to pay for them. In addition, our program monitoring has shown that people consider the filter to be affordable and provide sufficient water for their household use. We will continue to do market research as the program grows and will make improvements and adjustments to our approach as we gather data. One further response to a comment put forward in the 'Rating and Comment' section. According to our budget, the producers are initially supplied with materials for their first 50 sales which includes filters and tapped safe water storage containers. The material costs for the filters are around $10 and the cost of the tapped safe water storage containers is around $3, hence the $6500 requested for the first 500 sales. The $3 profit for the sale of each filter is paid by the purchasing household and is obviously not requested in this proposal. Along with the material costs of the filter, this brings the selling price to $13. $10 goes back into the resupply fund. The tapped safe water storage containers are separate from the sale of the filters and it is up to the end user if they choose to purchase this in addition to or separately from an ACI water filter. Hope this clarifies the issue raised! Well thought through proposal, exhibits and Q&A responses. Support of schools, community and government seems clear on a village by village basis. Would involvement of a local club from an international service organization like Rotary add consistency to the monitoring process and possibly accelerate the rate of progress in expanding the project to other village/towns in the service clubs broader geographic area? In this case, the closest apparent Rotary club to Rigoma Market Centre near Kisii appears to be in Kisumu the site of the closest airport. As you know, Rotary's Service Above Self motto comes alive at the local level with programs such as you propose here. Thanks for your comments and questions. Your idea about working with Rotary is very interesting. As you may know, our project in the Kisii region began through a connection with Don Howard, a Rotarian from Colorado. We currently share some staff with his project. What sort of assistance would Rotary be able to provide in terms of monitoring? I think you are correct that Kisumu is the closest Rotary Club to Rigoma Market/Keroka and I have contacted Don to find out if there are any clubs that are closer. We have run a pilot training in Meru and it is likely that this will be one of our next areas of expansion after the Kisii region. There is a Rotary Club in Meru and it would be very helpful to have Rotary support in launching and assisting with oversight in that region. As I'm just beginning to get an understanding about the scale and importance of the world's water and sanitation problem, I can't avoid thinking about solutions of the scale that we involved with Rotary's aggressive international approach to nearly solving the world's polio challenges. An approach with attracted Bill Gates comment that "Rotarians get things done" and several donations totaling $350 million from the Bill and Melinda Gates Foundation. District and Club level, water and sanitation monitoring together may be a way to connect Rotarians long term. With an international motto of Service above Self and over 1.2M members in 33,000 clubs worldwide, Rotary seems well positioned with potential local monitors who can provide and independent perspective particularly as to whether projected benefits are continuing months/years after project completion. Armed with a digital camera, a few simple instructions and local contact information, these Rotarians could provide regular feedback into a forum like PWX. Lessons learned from this information would seem to be invaluable to further improving this process and the probability of a improved long term results locally. Finally, we were not aware of Don Howard's involvement and would like to hear his perspective. Also, Meru Kenya does have a Rotary club as you note. Perhaps an initial evaluation of a independent monitoring options could be tested in Rigoma Market/Keroka and then added as in integral part of the Meru program. Thanks for your very interesting feedback and suggestions. I strongly agree with your statement about the importance of local follow up. From my experience, committed local oversight is the best option for the long term ownership and sustainability of the program. We also know that outsiders tend to receive very different answers when they conduct interviews and household surveys and our goal is to get the most honest feedback in order to continually improve the program. I'll begin by giving you an overview of our current monitoring program. Our monitoring program in Rigoma Market/Keroka is carried out by ACI's 10 local Community Health Workers (CHWs) who operate independently from the local filter constructors. The CHWs are from the communities in which they work and local people trust them when they come to conduct tests on their filters and ask questions about their WASH situation. The CHWs will continue to conduct surveys (see attachment in the main proposal) on a random sample of households regularly and this is currently an affordable and workable option for ACI. We would be very interested in a fully independent monitoring procedure for our work, but for an organization of our size this could prove to be expensive. We are working with a professor from Hope College who is in the process of conducting an independent evaluation of the Aqua Clara program in Kenya. We are very keen to explore the possibility of an independent monitoring program that would involve Rotary and I suggest that we discuss this by email or phone in the near future. My initial thoughts about testing the independent monitoring program in Rigoma Market/Keroka is that it would have to be done in conjunction with the local Community Health Workers. Although Kisumu is the location of the closest Rotary Club, there are tribal differences that would have to be taken into consideration as well as the distance. I hope that this does not sound negative - I am just thinking through some of the practicalities! Meru would certainly be a more straightforward proposition for these reasons. I believe that there are many ways that we can work with an Rotary in order to strengthen the Aqua Clara program and ultimately make a sustainable impact on the WASH crisis and I very much look forward to discussing this with you further. We are determined to keep our focus on the local entrepreneurial model and continue to believe in its potential for growth and sustainability in the long term. The ACI program sounds like it is well constructed. One question though, do the sellers of the filters make any money on the transaction? I see that 820 Kenyan Shillings from each filter is paid back to ACI for the raw materials for the next one and 250 Kenyan Shillings goes to installation and maintenance. Together those add up to the whole price, so I am wondering how the seller makes any money. Thanks for your question. The filter constructer acts as the constructer, the seller and the installer, so he or she makes the 250 Kenyan shillings as profit. Hope that makes sense! 1. Do the residents in Kisii have to travel far to get to sources of water? 2. How do you find the demand for filters (ie is it high or low)? I know that you have sold a decent amount and that you have determined that the price is affordable, but I am wondering about the people of the region's feelings about the filters. Do they see the need for them and desire to purchase them? 1. From our household survey data and focus groups, we have found that people travel on average 40mins total to and from their water source. The most common sources are springs and surface water during the dry season, and we have found that a lot of people practice some sort of rain water harvesting during the wet season. This relatively short distance to the water source is one of the reasons that the program has been a good fit in this area as one of the conditions for proper filter function is regular and consistent use. 2. People are very positive about the ACI filters and about the program as a whole. The filter constructors currently have orders for 150 more filters and we predict that this number will continue to increase. People by and large seem to understand that their water needs to be treated to make it safe for drinking. From our focus groups and interviews, we have learned that people like the taste and clarity of the ACI filter water as compared to boiled water. Women in particular like the convenience and simplicity of biosand filtration as a water treatment option and have reported significant savings in time and money as they no longer need to procure firewood. People have reported that they were very keen to buy a filter after they tasted ACI filtered water in their neighbors' homes. Sounds great. Sounds like your program has been very well designed. One more question: how long does it take for the business owners to produce a filter? It generally takes 15-20 minutes to construct the filter body and piping. The time consuming and labor intensive step is the preparation of the filler material (sieving and washing the sand and ballast). Part of the agreement with the purchasing household is that they participate in this step. This has a couple of advantages as their participation helps to keep the filter affordable while also increasing their understanding of how the filter works. To keep costs low, the filler material is either prepared at the purchasing household or at the local school where the tools and materials are stored - if it is prepared at the school it is the responsibility of the purchasing household to transport or carry the material to their home. A filter producer working with a household can produce 1-2 filters per day including installation and instruction time. The project build on previous experience and has a sound demand. I support the demand driven approach over a purely needs based approach. Impressed that no subsidy is required, however the budget states a cost of $6500 for 500 filters which puts a material cost of $13 per unit. If the units are being sold for $13 as stated in the Q&A then there is no $3 profit margin for the producer. Surely for the revolving fund to be sustainable then the full material cost (plus costs for water quality testing after the OXFAM kits run out) needs to be recovered from each sale. A note on the EcoSan for your H20pe centre. You may find that a simple and low-cost version such as the arborloo or fossa alterna design may be a useful demonstration model. Initially a urine diverting toilet may not be affordable, or culturally acceptable if attempted to be replicated in communities. A simpler composting toilet without urine diversion may be an easier way to break into the market an establish EcoSan on the sanitation ladder with less behavioral change required. From there, as user acceptance and the added value of EcoSan is established, you can look at climbing 'the ladder' to more advanced versions. The project is good,supported with photos. project has very good community involvement and engagement, both key elements of sustainability. the cost to benefit ratio is good. this coupled with the educational component and the known track record of the modifyied BSF makes this a good bet. 1. I think that from a health standpoint filters are only an adjunct to other ways of providing water because they do not provide enough water for hygiene. 2. While the entrepeneurial approach is interesting thee is not enough market research to insure that the filters will be bought. Training centers are a great way to spread the work and message. However, we have not much real data on actual effectiveness. Hope to hear good stories over a long period from this one. Great job! I think it would be great to see a stronger on the ground local monitoring program. The program is strong as long as there is demand for the filters, and it seems that there is. The price of each filter is low enough to be affordable while still producing a profit for micro-entrepreneurs. It meets a perceivable need in a sustainable way. ACI Hope Center for WASH Training and Launch of 10 new local businesses is well thought out and documented in detail. I believe it is very likely to be successfully implemented by Aqua Clara, one of PWX's newest members. To date ACI's work in this remote area of Kenya has resulted in 16 ACI water filter producing groups and 10 related Community Health Workers. The building for the proposed centralized training center has already been donated by community members. It will house the demonstration site, training facilities and offices for support staff. In addition, Aqua Clara has indicated openness to continue partnership and expand relationships with Rotarians who are committed to insuring that project investments actually deliver long term benefits as originally intended. With 1.2M Rotarian's in 33,000 clubs around the world looking for local community service projects, Rotary International would seem to provide an excellent opportunity to develop simple, consistently applied approaches to monitoring project effectiveness thereby accelerating the speed in attaining the world's critical water and sanitation improvement objectives. Excellent and very well designed project . - Congratulations ACI for developing a low cost, affordable, simple and local made bio-sand filter for the purification of polluted water. - It is interesting to know that once the filers are installed, used and maintained properly it has a durability of 10 years with no maintenance cost. A good feature is that along with the sustainability, it could be easily replicated in other rural areas, especially in other underdeveloped countries.